President slams gun owners who oppose coming “common-sense” gun bans and restrictions, admits he will issue Executive Orders to enact them. His Heinous, appearing before his media clowns and palm-lickers – nebulously addressed his plans to ban guns feeding the hysteria from the Ruling Class Marxists to ban, regulate or abolish guns and gun ownership. 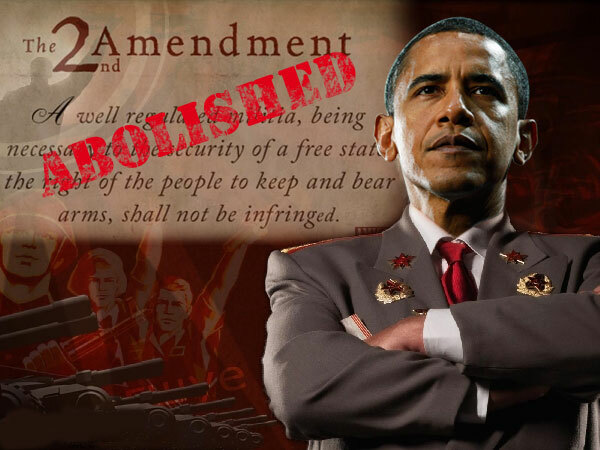 In Classic Saul Alinsky style – Obama freezes the target by declaring yet another enemy of the state (gun owners), polarizes them, and makes it personal. In one fell-swoop, Obama demonizes gun owners and said that the spike in record gun sales is the result of (right wing) “media” types/lobby “ginning up fear”, and gun retailers making a profit off that fear. Recall that this is the man who declared rural Americans “Bitter Clingers”, clinging to their guns and religion rather than embracing ‘change’. PRESIDENT OBAMA: Well, I think, for example, how we are gathering data, for example, on guns that fall into the hands of criminals and how we track that more effectively — there may be some steps that we can take administratively, as opposed — through legislation. As far as people lining up and purchasing more guns, you know, I think that we’ve seen for some time now that those who oppose any common-sense gun control or gun safety measures have a pretty effective way of ginning up fear on the part of gun owners that somehow the federal government’s about to take all your guns away. And you know, that — there’s probably an economic element to that. It obviously is good for business. But I think that, you know, those of us who look at this problem have repeatedly said that responsible gun owners, people who have a gun for protection, for hunting, for sportsmanship — they don’t have anything to worry about. The issue here is not whether or not we believe in the Second Amendment. The issue is, are there some sensible steps that we can take to make sure that somebody like the individual in Newtown can’t walk into a school and gun down a bunch of children in a — in a shockingly rapid fashion? And surely we can do something about that. And — but — you know, but — but part of the challenge that, you know, we confront is, is that even the sight — slightest hint of some sensible, responsible legislation in this area stands this notion that somehow here it comes and that everybody’s guns are going to be taken away. It’s unfortunate, but that’s the case, and if you look at — over the first four years of my administration, we’ve tried to tighten up and enforce some of the laws that were already on the books. But it’d be pretty hard to argue that somehow gun owners have had their rights infringed.Obama says there is plenty he will be able to do by using his unilateral power of executive orders to enact “steps” to ‘reduce gun violence’. So he admits he will act as a dictator, and simply decree laws upon guns and gun owners. Obama admits he will act as dictator, bypass Congress and issue orders making law by decree regarding guns and gun ownership. He declares this to be ‘common sense’ and anyone opposing him, is “ginning up fear” which he says is ‘good for gun sales’.